Just how old is Suzanne Somers anyway? That’s the question in everyone’s mind upon meeting this vibrant, youthful health advocate, who is the author of 25 books. 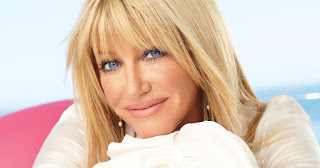 Suzanne Somers is living proof of her self-described “new way of aging.” Although she appears ageless, Suzanne proudly reveals she is an amazing 72-years-old as of this 2018 interview with Life Extension’s Michael A. Smith, MD. Listen to the interview by clicking here to download this Live Foreverish podcast episode for FREE on iTunes! Dr. Mike agreed that hormone replacement is not faddish nor exotic, but a way of balancing our body’s own messengers that enable the brain and the rest of the body to communicate with one another. When asked how she responds to nonbelievers in hormone replacement therapy, Suzanne replied that she tries to set a good example. Signs and symptoms are often the language of the body when it asks for what it needs. “The Seven Dwarves of Menopause” so often referred to by Suzanne—itchy, bitchy, sleepy, sweaty, bloated, forgetful and all dried up—could be an expression of the body’s need for hormones. Replacement of these hormones should not guided by guesswork, but by the results of comprehensive bloodwork. We’ve all known people who have experienced this prolonged decline. They may have had the best doctors but, as Suzanne remarked, none of them were talking to each other. At that moment, Suzanne decided to change her life. In addition to food and sleep, another factor that needs to be considered when trying to improve our health is our environment. While it appeared as less of an issue several decades ago, many believe we are currently under an environmental assault that may be the greatest in the history of humanity. However, we can create a healthy environment at home by the choices we make in regard to our diet, what we put on our skin, the air we breathe (which can be filtered with air purifiers), and the cleaning products we use, which should be nontoxic. Suzanne offered her listeners a sneak preview of her upcoming book. Ficks CA et al. Curr Psychiatry Rep. 2009 Oct;11(5):387-92. Bilbo SD et al. Exp Neurol. 2018 Jan;299(Pt A):241-251. Fowlie G et al. Int J Mol Sci. 2018 Aug 1;19(8).